Australia is the continent which glows beautifully between Pacific Ocean and Indian Ocean. Nobody will say no to visit such a fantastic largest island in the World. If you are seeking for the place to enjoy the vacation then you must rush out to plan your trip to visit Australia at the most economical price. Plenty of packages are available to visit Australia with your family or friends. Couples looking for amazing honeymoon spot can choose Australia to celebrate their startup. Australia offers you several unexpected memories and adventures. 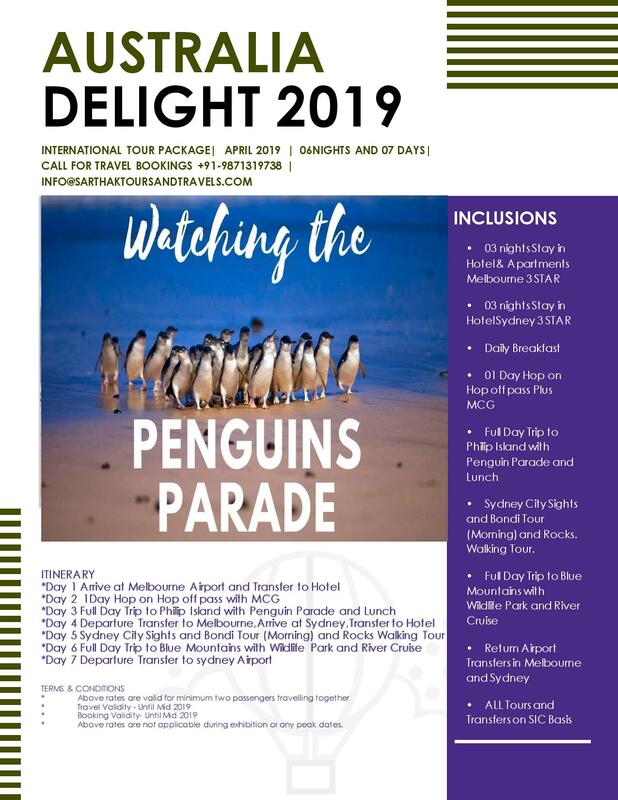 Here let me share some important and best places to visit in Australia so that you can select the tour package easily. Sydney is the capital of New South Wales, a modern and large city in Australia. Though the city’s reputation and look is expensive you can do things here at cheaper cost. Some beautiful things in Sydney to enjoy are Harbour Bridge, Opera house, Ferry ride over to Manly, walk between Bondi Beach to Coogee Beach, pleasant evening at Botanical Gardens, and much more interesting spots are available. Sydney is well-known for its nightlife, shopping, cultural attractions and some beautiful architecture. The Whitsundays is made up of 74 islands and it is the home for the famous beach Whitehaven beach in Australia. The magical atmosphere around the island gives you the fresh feel and mind blowing memories. The place filled with turquoise water, secluded bays, pure white sand, etc. Enjoy the beauty of sunset along with the interesting water sports. Qualia resort is the place nearby the beaches where you can expect a luxury stay during your visit to Whitsunday. National gallery of Victoria and the list goes on. It is located in Australia’s Northern Territory which became the home for numerous biodiversity nature reserves. The park consists of nearly 2000 attractive plant species and wildlife. Jim Jim falls is the largest waterfall in this territory. Some historic rock paintings and historic representation can also be viewed in Nourlangie, Nanguluwur and Ubirr in the park. Some interesting things you can do in the park are exploring the beauty of Aboriginal rock art which are 20,000 years old, you can hike on the rugged escarpments to the top, and cruise around the wetlands water lilies and swim around the waterfalls. It is the city in tropical far north Queensland. If you are seeking for the place to relax during your trip, then head to Cairns which have several must see places. Atlnat, Myrtle Beach, Phoenix, Columbus, Fort Worth, Cleveland, Portland, Ft Lauderdale Vacation, Pigeon Forge, Savannah and much more. Margaret River which is famous for its boutiques, wineries, and craft breweries is located in the Western Australia. One can enjoy incredible surfing in the beaches, gorgeous coastline, mysterious eucalyptus forest, coffee houses, gourmet foods, cheese factories, mountain bike trails, stunning landscapes and multi chambered caves are the beauty of the Margaret. It has more 200 vineyards and it celebrates the wine festival which attracts people around the world. It is the gateway to visit the desert region of Australia located in the Northern region of Australia. Explore the Red centre from Alice Springs it is the place for Aboriginal art, historical things and several events like Henley-on-Todd Regatta. Go around the desert on camel or have a gourmet dune top dinner. Attractive things to explore in Alice Springs is West MacDonnell Ranges, Devils Marbles, Simpson Desert, Kings Canyon, Red Centre Way, Uluru, Kata Tjuta, Larapinta trail, Alice Spring Reptile centre, Desert Park and much more. This place gives you the feel of being in a huge desert. It is the most populous city in Australia and is the capital of the island state Tasmania. The Hobart sits on the river Derwent and it is the fashionable place which has several sandstone warehouses, host galleries, and lovely cafes. The hot spot of Hobart are Mount Wellington, hiking, cycling, etc. Shopping lovers can head to Salamanca market which is famous for both gifts and foods. If I am going on listing the best attraction in Australia the list will not have an end. Since it has plenty of tourists attractions it would be worth to invest money to spend a great time with your family. Any increase in Airfare, any applicability of new taxes from Govt. Breakfast. Morning Half Day SIC Melbourne City Tour . See Captain Cook’s Cottage (from outside), Queen Victoria Market, Fitzroy Gardens and Albert Park, home to the Australian Grand Prix. Stroll the Royal Botanic Gardens, see the Royal Exhibition Buildings and Federation Square. Visit the Shrine of Remembrance and see the Southbank waterfront precinct. See some of the city’s architecture including St. Paul’s Cathedral and the Princess and Regent theatres, MCG from outside., ETC. Overnight at Hotel.